Look at my beautiful new hat! Isn't it fabulous? It is from my friend Jen at Mad Cat Hatter! Can you see the daisies on the hat and on the hatband? And a PINK feather, too. It is just my style. And you can hardly even see the tiny elastic band that holds it on my tiny head! I am very extra proud of my beautiful chapeau! 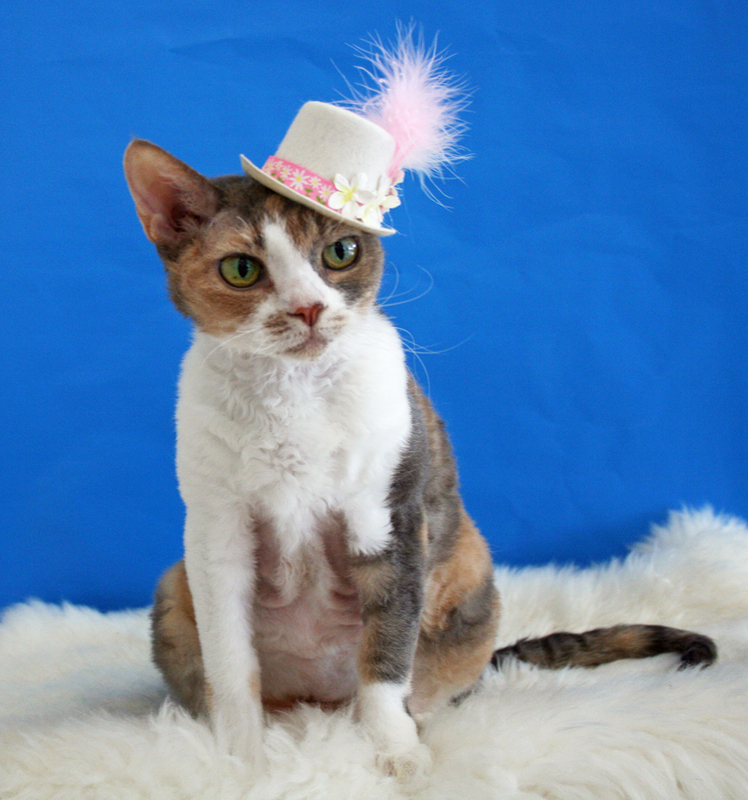 If you want a special cap, I give the Mad Cat Hatter all FOUR paws up. Thank you for making something so perfect for me! OMC, that hat is adorable on you, Daisy! My human is bummed I hate wearing them because she would love to get me one. Miss D - you are such a beautiful hat model. What a beauty. A dainty daisy hat for a dainty Daisy! Purrfect! Good Lord, Daisy- I must say, you have the patience of a saint to sit still with that hat on your head! 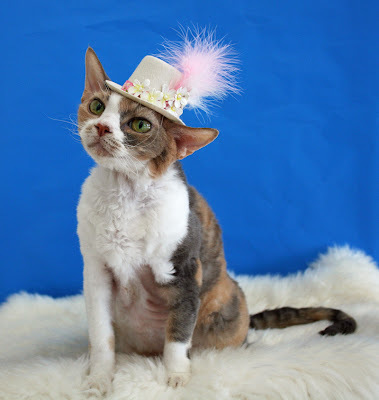 That has got to be the most stylish kitty hat we have seen. Your hat is perfect for you--I was wondering how it stayed on. Thanks for explaining about the strap. It looks beautiful on you! That is a very fancified hat! It is also kind of pimp. Pimp approves! Daisy, that hat is so purrfect for you. That is so terrific with the daisies on it too. We just love that. Hope all have a great day. That is a very jaunty hat, Daisy! We love it!! that is fabulous! I want one just like it! i'm a sucker for a beautiful babe in a hat. Are you going to a wedding Daisy? Daisy, as Billy Crystal would say, "You look MAHVELOUS!" Daisy that hat is wonderful - just what all of the cats were wearing in Paris during my last visit. Beautiful hat! I hope you wore that for the Queens Jubilee celebration earlier this month. it was perfect! Oh Daisy! You look magnificent!!! 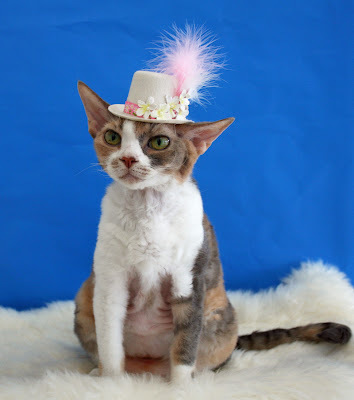 That hat is purrfect for you! That is a truly magnifique chapeau, Daisy! Daisy your hat is to die for! We luf your new hat, Daisy. We wonders what wonderful outfit you'll wear with it? OMG! Daisy, you´re the most beautiful cat model in the world! Daisy that hat looks fantastic on you! Daisy, that little hat is DIVINE. That is the perfect hat for you Daisy! Gorgeous! that could be next years Easter bonnet or are you going to the 2013 Kentucky Derby? Oh Daisy! That is a marvelous hat and you look smashing in it!!! That is a seriously pawsome hat. And it looks so wonderful on you. That hat is so perfect for you in about every way possible! That is a gorgeous hat Daisy and you look beautiful in it. You're an amazingly good model! That hat is beautiful and you wear well! But it doesn't look very mad. Daisy! That is a great hat! Pink and daisies and just the right size! Oh WoW! That is purrrfect! Allie: *dreamy sigh* that is simply DIVINE, Daisy! And of course, PINK. Just the perfect accessory to a (PINK) summer ensemble! What a cute hat!! I love the fluffy pink feather!! You look very pretty, Daisy! Daisy , I say it again = everything suits a beuty !!! That is ADORABLE! You're such a good model to wear a hat too...I think I would be wiggly. You look beautiful in that hat. Kizzie would never be so patient and wear one, unfortunately. I almost want a human sized one for myself. 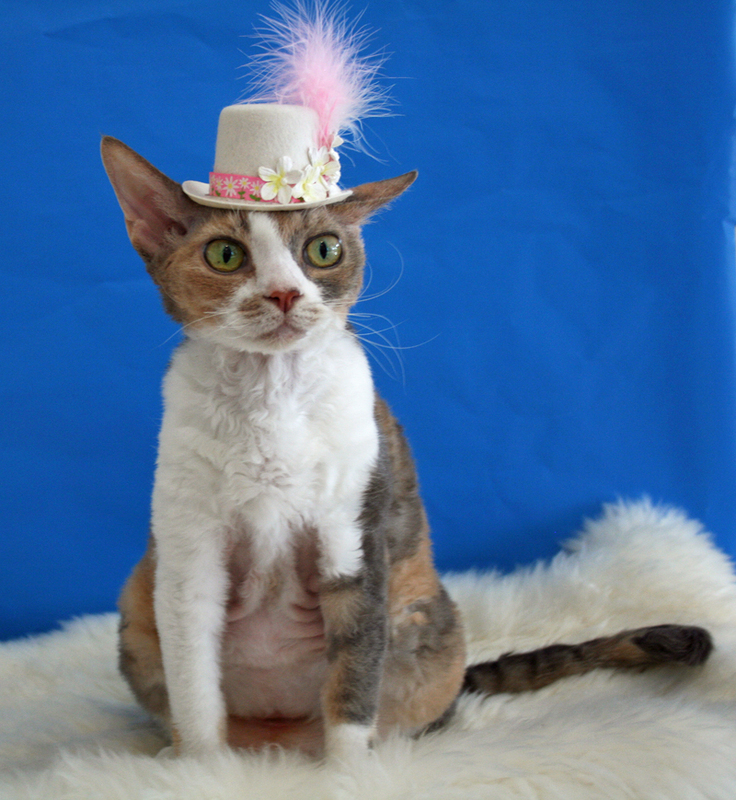 that do be a PURRFECT hat for you Daisy! But what about Harley? I do thinked Harley might could liked to had he's own hat too! Your hat is gorgeous! It is purrfect for you! Its absolutely perfect for you Daisy!